Talking Technique Ep 05: Why don't you... have a love affair with pauses? 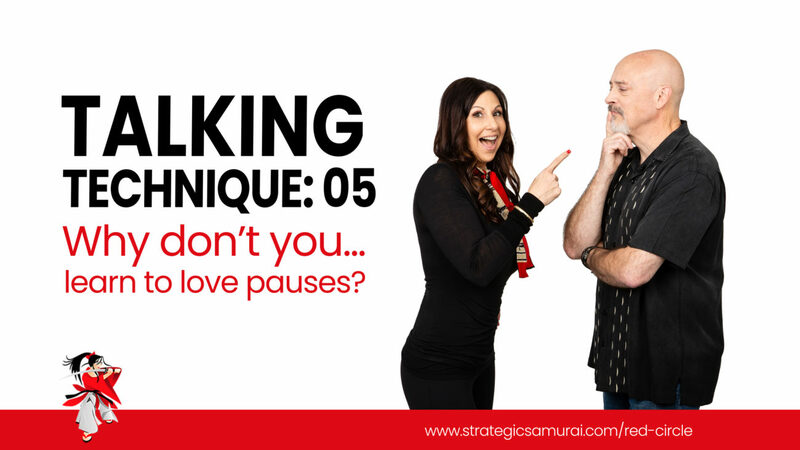 Talking Technique Ep 05: Why don’t you… have a love affair with pauses? You can use pausing in your storytelling. You can use pausing in your lessons. You can use pausing to draw attention to a moment. The pause is an underline to any statement you’ve just made. Also, strategic pausing can bring an audience back from wandering attention. As a speaker, you can use a pause to allow your brain to catch up to what you’re going to say next. By planning moments where you pause to emphasize what you just said, it can allow the audience to feel what you’re feeling. Kymberlee: ... have a love affair with pauses? Ah. Pauses. They can change your speaking by orders of magnitude. Alan: It is rare that I ever have to tell somebody to speak faster. By far, the most common problem with speakers is not taking the time to pause and let the words emphasize themselves. Kymberlee: You can use pausing in your storytelling. You can use pausing in your lessons. You can use pausing to draw attention to a moment. Alan: Your brain gets used to a certain sound, tone and rhythm. As you talk and tell your story, if you keep using the same tone and rhythm, the brain starts to ignore it. You start to wander off, thinking about other things. It's the pause that breaks that rhythm and brings the mind to you again. That lets your audience focus again on what you are saying. Kymberlee: And as a speaker, you can rehearse different pausing techniques and try it out. In your rehearsals, try pausing in places you don't normally pause, or try adding really long, uncomfortable pauses. See, everyone in the studio is leaning in because they don't know what we're going to say next. Alan: Pauses should be choreographed, just like you would the rest of your talk. The way you emphasize with your hands, the way you reach out to the audience and make a connection, a pause in the middle of your talk, again, emphasizes what you're saying. The pause is an underline to how important a point is you're trying to make. Kymberlee: Here's a tip. As a speaker, you can use pausing to allow your brain to catch up to what you're going to say. Let's say you've memorized a certain lesson, a certain way that you want to teach it to your audience. You can use pausing to allow your brain to catch up to what you're going to say next. And so, the audience may not know exactly what you're doing but you, on the other hand, are getting your brain revved up to remember that point that you want to make. Alan: Pause also transmits emotion. It allows the audience to feel what you're trying to speak to. So, if you're telling a very emotional story, there is nothing wrong, in fact it's best, if, as you tell a particularly emotional component to pause, and let the audience see you struggle. That piece of it adds weight to the story. It brings power to it. Kymberlee: So, try to experiment with different ways of using the pause, within your story, when it doesn't feel comfortable, and you'll find gifts when you do push yourself to experiment with this and try different techniques within the pausing for different effects. Talking Technique Ep 01: Why don’t you… open your talk with a story? Talking Technique Ep 02: Why don’t you… allow your audience to FEEL? Talking Technique Ep 03: Why don’t you… look them in the eye? Talking Technique Ep 04: Why don’t you… follow your fear? Talking Technique Ep 06: Why don’t you… tailor your talk to your audience?